Marc speaks with Nobel Peace Prize Winner Wangari Maathai, whose latest book The Challenge for Africa examines some of the biggest obstacles that the continent faces, and Dr. Maathai's ideas about how to meet them. 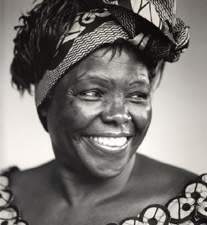 Marc speaks with Nobel Peace Prize Winner Wangari Maathai, whose latest book The Challenge for Africa examines some of the biggest obstacles that the continent faces, and Dr. Maathai’s ideas about how to meet them. Then, we all work so hard to make money and reward ourselves for our hard work by consuming–homes, cars, boats, clothes, good food. But is consumerism bad for us? Are we biologically ill-suited for consumerism? Peter Whybrow thinks so, as he recently argued in The Chronicle of Higher Education. He spoke with Marc about the way we live our lives and how we could get off the hedonistic treadmill.